Turn your class into a game show! Why is it that quizzes are boring but question-based game shows are fun? Whatever the reason, you can bring the excitement of game shows to your classroom with these modifiable games, hosted by superteachertools.us. The website contains ads, but they are G-rated. This free web-based program, available at https://www.superteachertools.us/millionaire/, is just like the TV show but you can plug in your own questions and answers. You can also access games created by other teachers, which are searchable by topic. 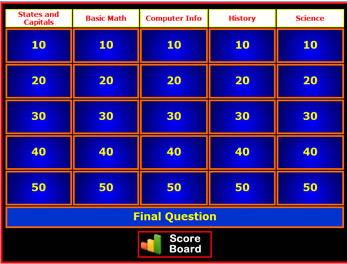 Answers are multiple-choice, and students can use hints and lifelines. The game works best for single players. This free tool, available at http://www.superteachertools.us/jeopardyx/, lets you can create a custom Jeopardy review game for up to 10 players or team-based play. Teams choose a question, then try to give the best answer. Scoring is built in for each team. You can insert your own pictures, symbols, and even drawings into your review games! Tagged Jeopardy, quiz show, review games, Who Wants To Be A Millionaire. Bookmark the permalink.